Now that the holidays have passed the only thing left to do is celebrate the New Year! To get in the party spirit we’re showing off some fabulously trendy bridesmaids dresses that could easily double as your New Year’s Eve party dress. These hip easily repurposed looks will let you bring in the new year in style without breaking the bank. If you don’t have any of these sleek silhouettes stashed away amongst the bridesmaid dress collection in your closet–that’s ok! You can still use these sassy styles to inspire your upcoming New Year’s Eve look. 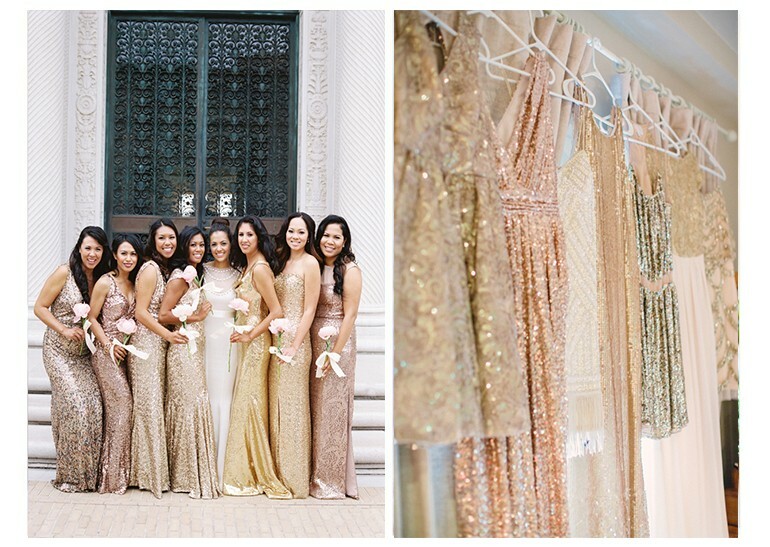 If you had the pleasure of wearing one of these glittering gowns you’re in luck! Sparkles and shine are a staple on New Year’s Eve. The winter season makes wearing a floor length dress completely reasonable. However, depending on the fanciness of your planned outing you can always get your long dress hemmed into a more cocktail-party approved style. If your dress is already short you just have to to slip it on for another fabulous night of celebrating. Perhaps the best thing about this unique two piece bridesmaids style is how easily repurposed it is! 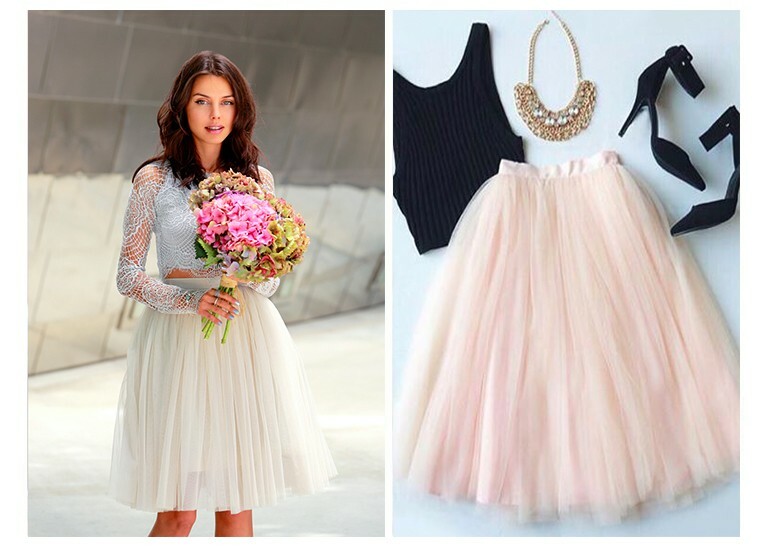 A tulle skirt can look super sweet and girly on the day of the wedding, but when paired with a sleek black top and statement necklace the look transforms into one worthy of a holiday evening. 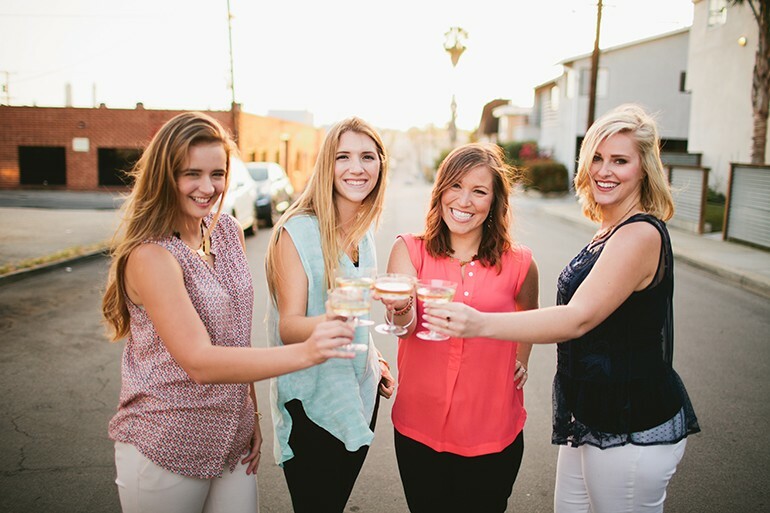 Since this trend is still up and coming, we can bet not very many of you have it stashed away in your closet. Nonetheless, this New Year’s look is totally replicable and a tulle skirt is easy to find in stores or online. 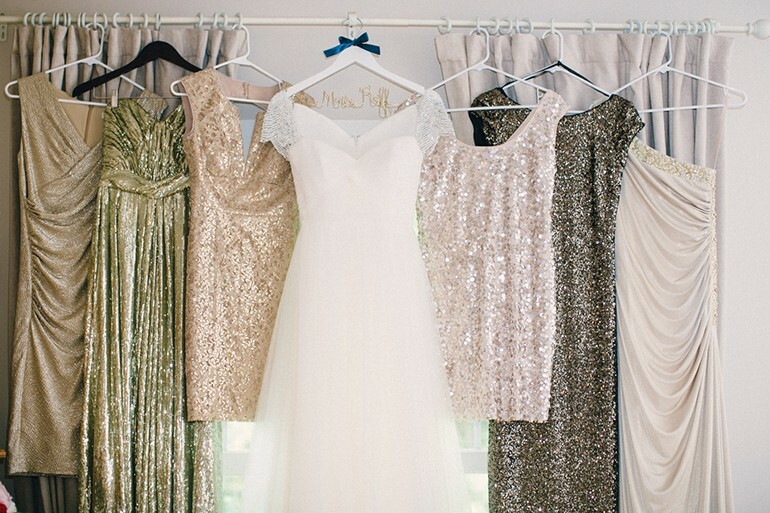 We think each of these vintage dresses would make a stunning look this New Year’s Eve. 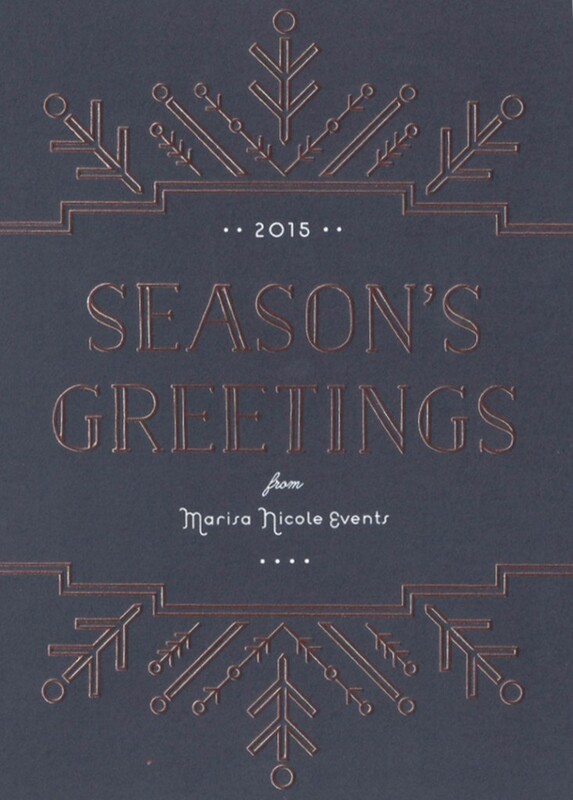 Shades of silver, cream, and charcoal are all flattering and festive. 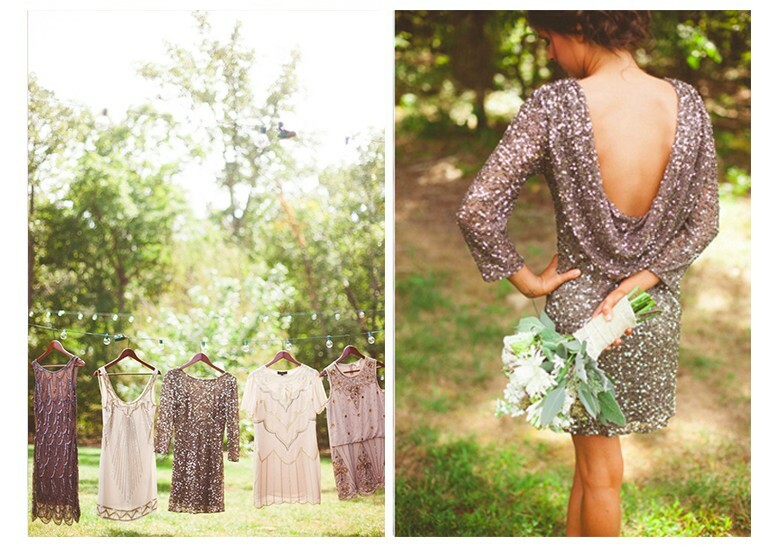 Not to mention– the beaded details on these 20s inspired dresses will have you shining all night long. 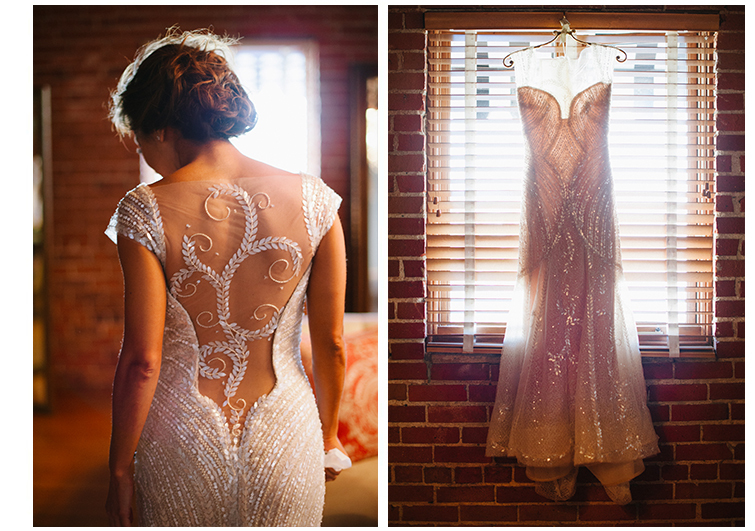 We especially like the low back of the glittering sheath on the right. Even without the sparkling fabric, a shape like this is a statement on its own. Nothing says evening party quite like a black dress. Rather than turn to the classic little black dress, why not re-try one of your lengthier silhouettes from a past wedding? A deep tone like black makes the sassy slits on these black dresses a showstopper. If this look isn’t something you already have, look for a dress with modern asymmetry like that of these sophisticated bridesmaids gowns while shopping. On the contrary to wearing a LBD again this New Year why not mix it up with a deep jewel toned look like these lovely dresses from Jim Hjelm Occasions. 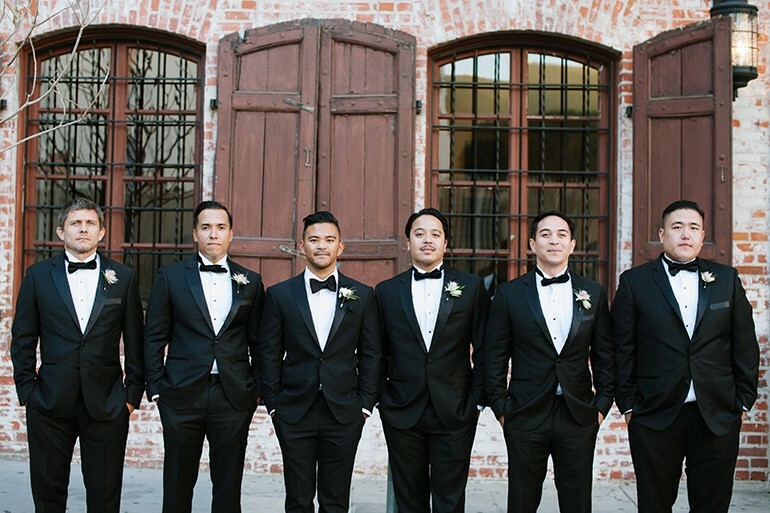 Each of the options pictured would look nice long or shortened depending on the attire of your planned event. Most importantly all of these gowns’ figure flattering shape will look just as fabulous during the ball-drop as they did on the dance floor at your best friends wedding. 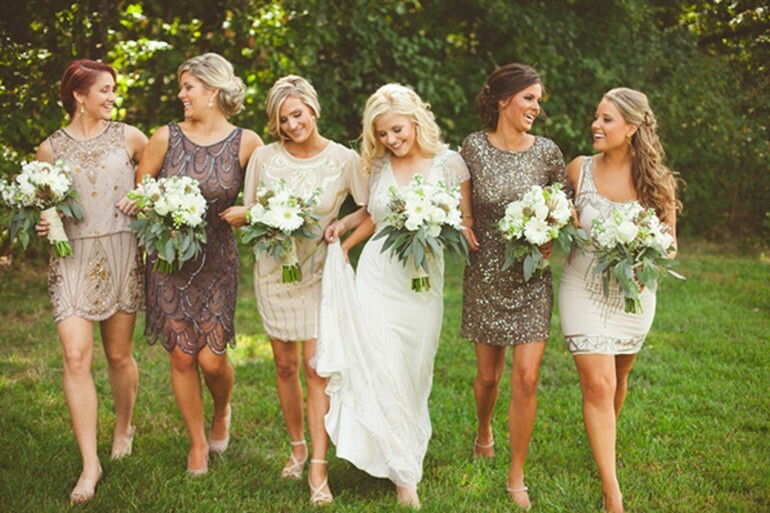 These days bridesmaid dresses are so stylish you’ll want to re-wear them. New Year’s Eve is the perfect occasion to pull out your particular favorite. 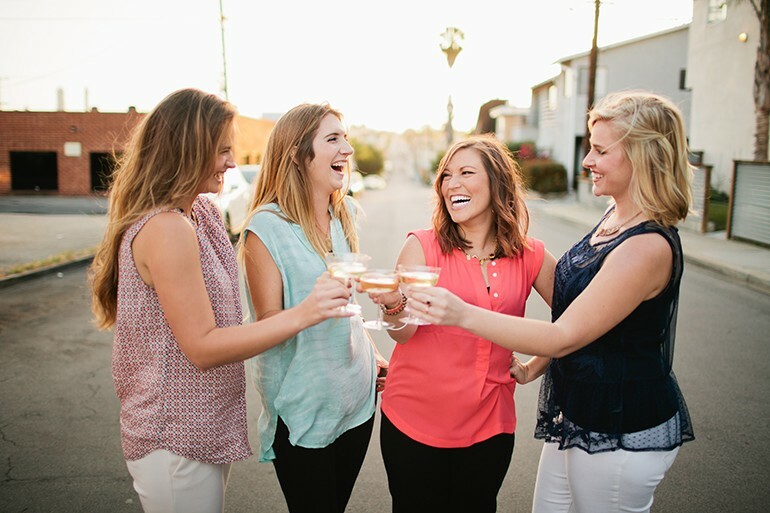 Whether you’re going out on the town with your girls or attending a swanky soiree with your better-half, we hope your New Year’s celebrations are fabulous, fun, and complimented with your best look yet! 2015 has been a banner year! We have seriously adored all our clients and have collaborated with some seriously talented event creatives to produce one fabulously styled celebration after another. 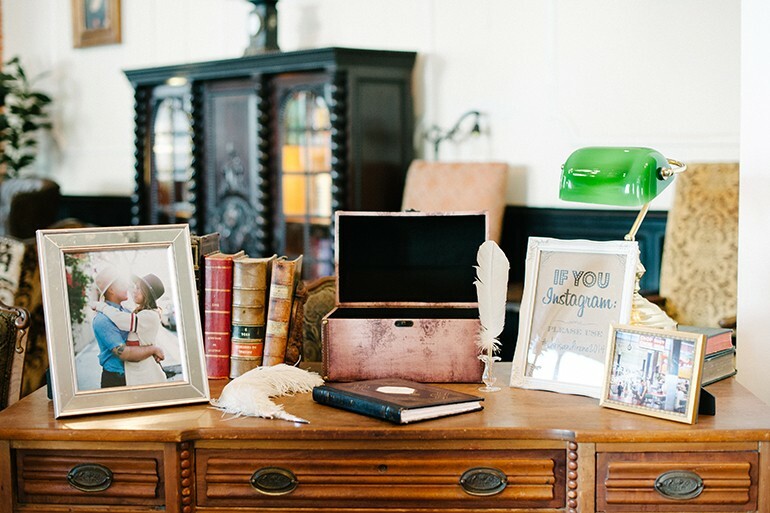 We are still swooning over all the gorgeous soirees we were a part of this year! 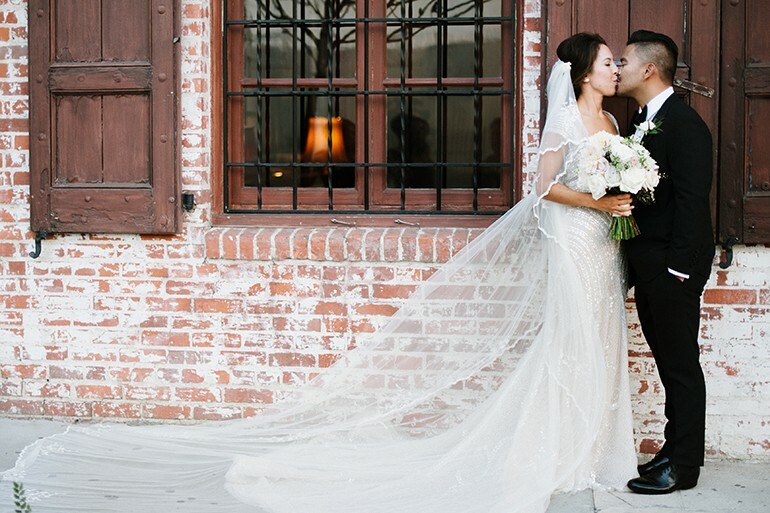 We at Marisa Nicole were also super excited to be chosen as a finalist for California Wedding Day Magazine’s Best of Weddings Award for Best Event Design Los Angeles and honored to win The Knot Best of Weddings for the third time! 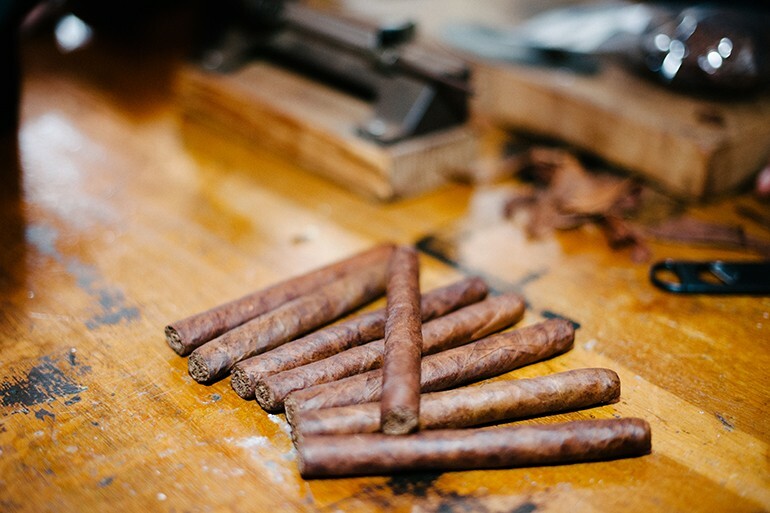 We’re hoping 2015 has been as good to you as it was to us! Thank you so much for helping make this year so gosh darn fun! Wishing you and yours a happy, merry holiday season! 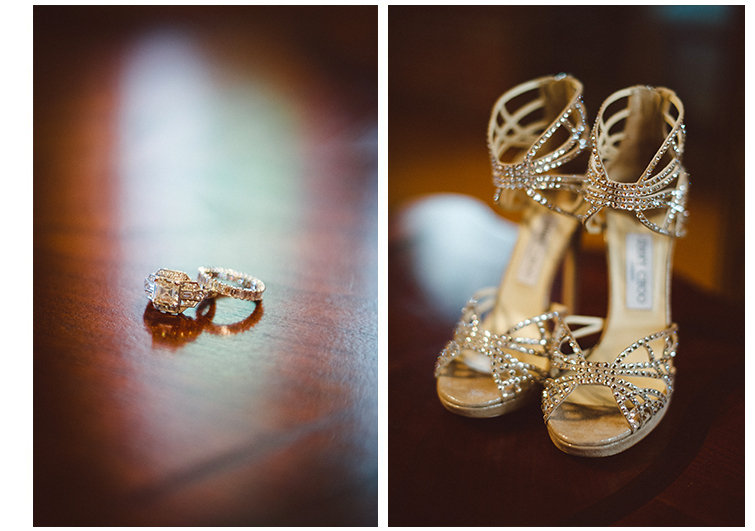 Love at Carondelet House: Irene & Chris Married! 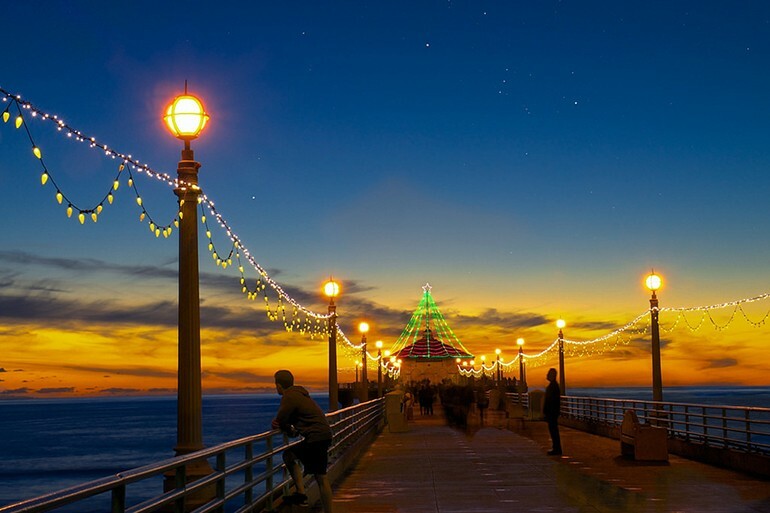 California winter has finally come to LA (you know, when the highs are in the low 60’s and the lows in the in the high 40’s, brrrr). 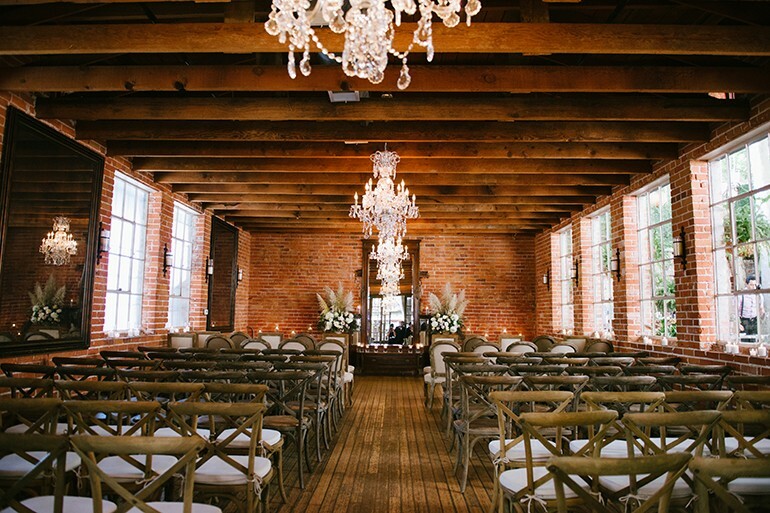 As we break out our sweaters and cozy up with a mug of hot cider, it seems that it is the perfect time to share one of our most gorgeous weddings with you at one of our all-time favorite venues. 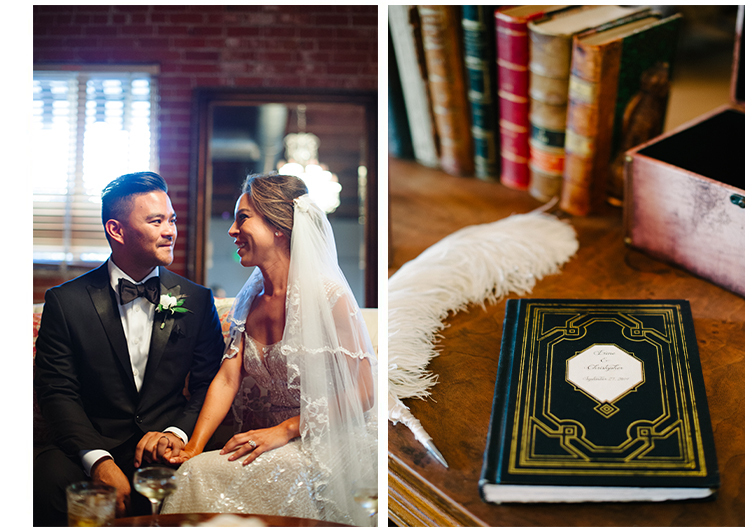 Last year I had the pleasure of planning and designing Irene & Chris’ beautiful Carondelet House wedding in downtown Los Angeles. 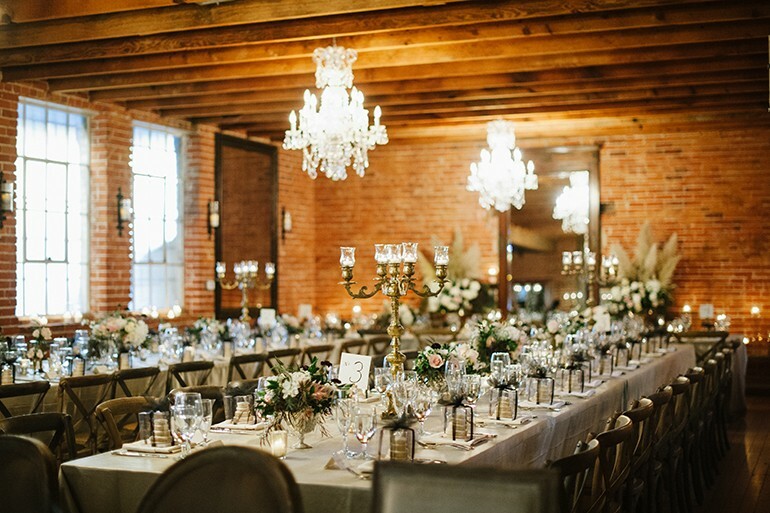 Between the exposed brick, hardwood floors, hearty fireplace, enchanted spanish patios and breath-taking chandeliers, this venue is probably one of the most swoon-worthy venues I have ever set foot on. Carondelet House has a homey yet grandiose feel. And because it is situated in downtown LA, you get the a lovely combo of charming luxury with a dash of grit. It really is a special place. Irene has a fabulous sense of style (so you know that the designer in me was absolutely stoked)! She is the kind of gal who is wearing the hottest trends right before you knew it was a thing. Seriously, I would see her wearing a fashion one week, and then two weeks or a month later, it was everywhere. I just came to realize that if Irene was wearing it, I should totally get on board. The same was true when it came to her wedding aesthetics. First and foremost, we need to take a moment to pay homage to her attire. Seriously Irene, seriously? You look like a star from the golden age of cinema combined with a fabulous on-trend fashionista. I just can’t get over her gorgeous look! And remember when deep reds and purples became a thing in 2015? Irene focused on those hues (paired with fab neutrals) a full year before anyone else was even thinking about doing it. 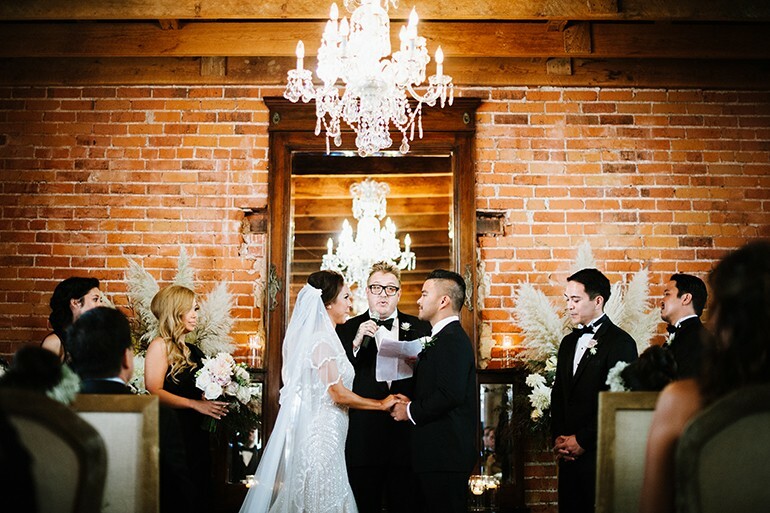 Irene and Chris wanted us to create a formal, romantic affair for their guests. We draped the long wooden tables with the most luxe champagne linen I could get my hands on (it was insanely heavy and seriously felt like butter). Our floral designer Judy perfectly brought in a combos of both deeply saturated and light hues as the base for our color pallet. 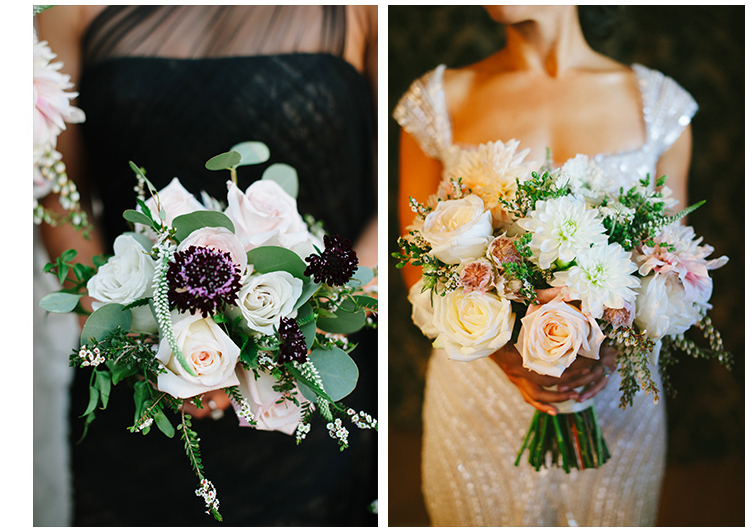 She paired feathers and peeks of greenery and awesome texture with big ruffled romantic blooms. 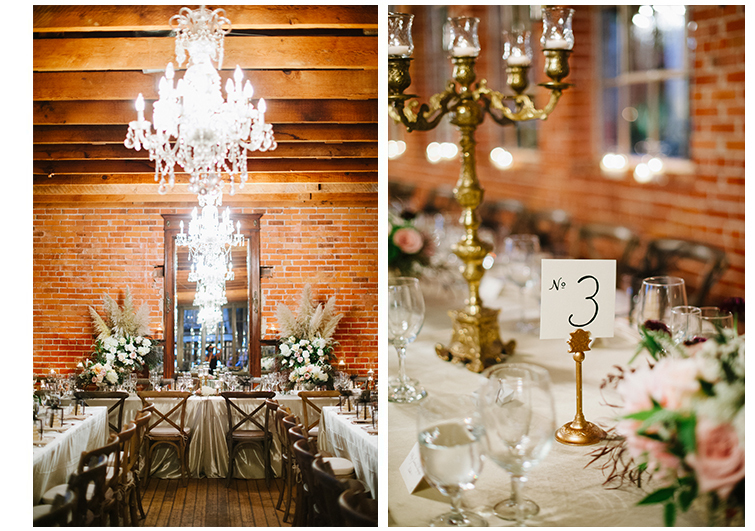 Candelabras were everywhere and the whole place glowed. 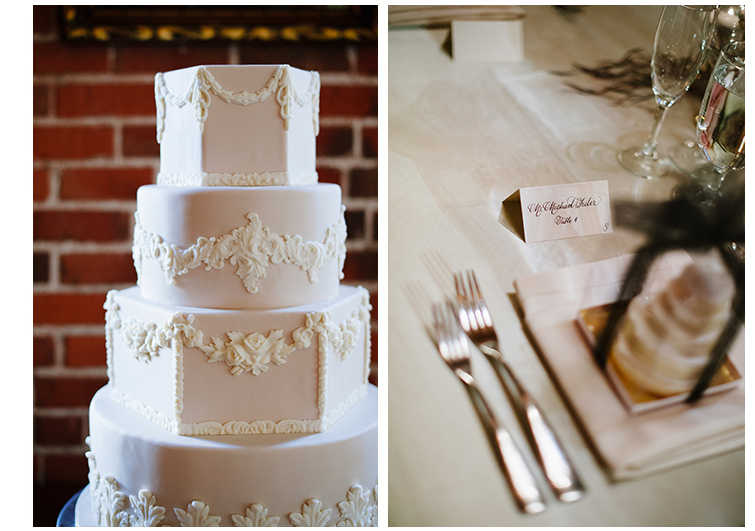 The place cards and table numbers were hand calligraphed and not a detail in the design was overlooked. Man, I just love it when I have bride who let us go all out! The guests feasted the most scrumptious meal and later the most beautifully designed cake (which FYI totally tasted and it was just as good as it looked). 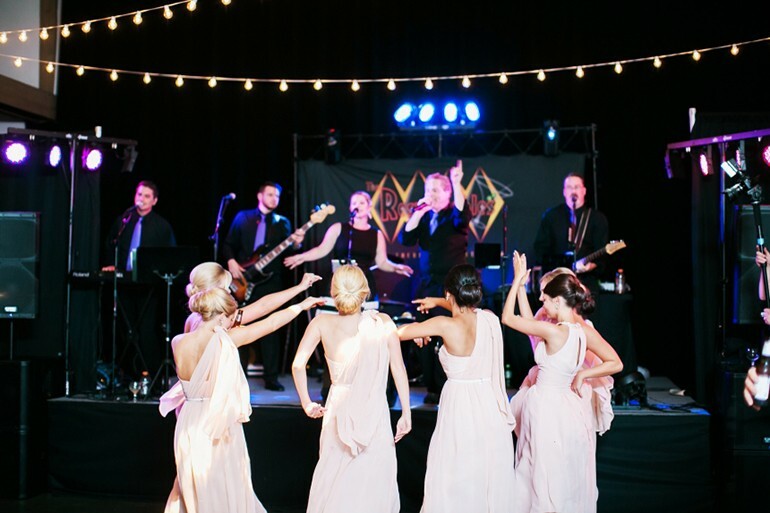 We had live music throughout the event, and the guests danced the night away. 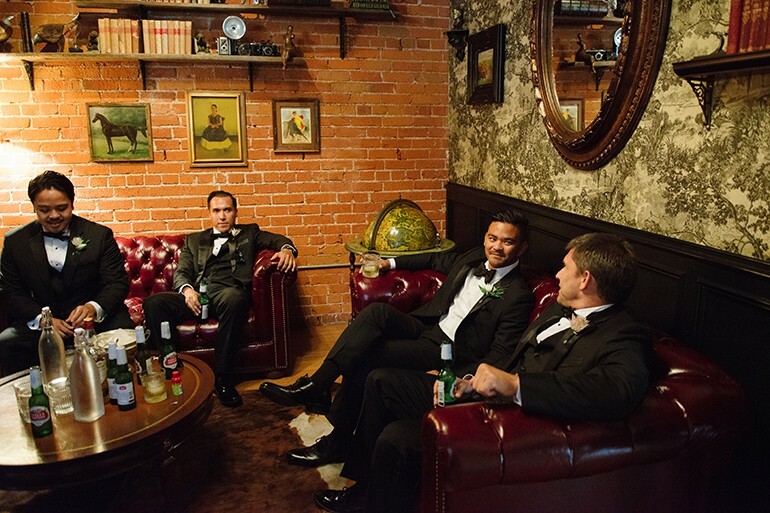 We brought in a photobooth and cigar bar for the guests to enjoy. 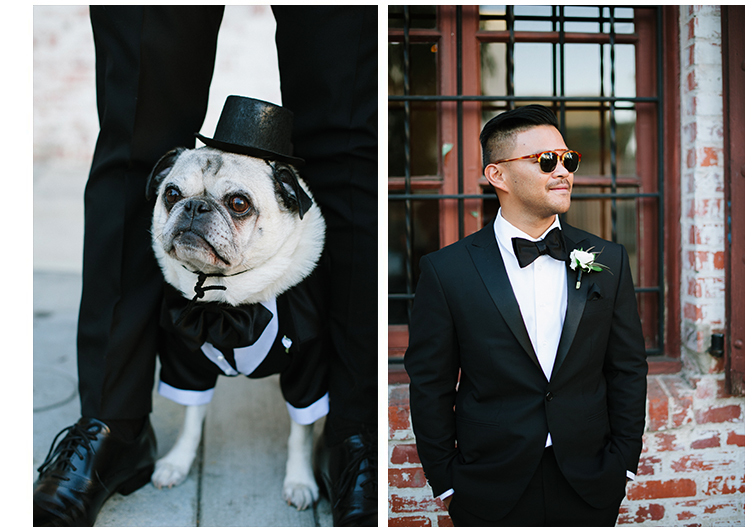 If all this wasn’t enough, we even had the couple’s super cute pug on hand to steal away the day! This is one of those days that will always hold a special place in my heart. Thanks so much to the whole wonderful team of creatives who helped us throw such a fun, formal and fabulous fabulous fete for Irene & Chris! Step one to having a festive party is to deck the halls! 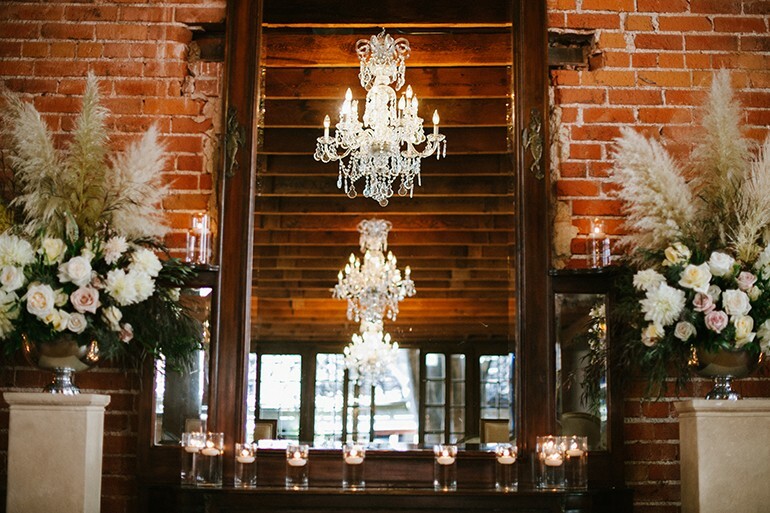 A little winter décor can go a long way in setting the mood for your guests to mingle and be merry. Plus, some décor doesn’t purely function as party decorations. Below are some options for how to fancy up the house for the holidays that you can enjoy all season long. Nothing says “Tis the season” quite like a lovely pine wreath. Rather than go out and buy a pre-made one why not craft your own? This DIY from Style Me Pretty looks fairly easy and super fun to make. 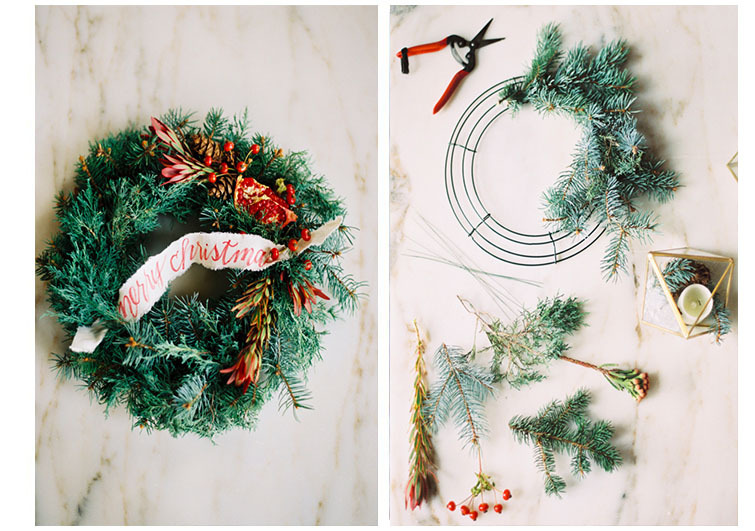 Creating your own wreath gives you the opportunity to decide how much structure and texture you want as well as what decorative additions you’d like to add. 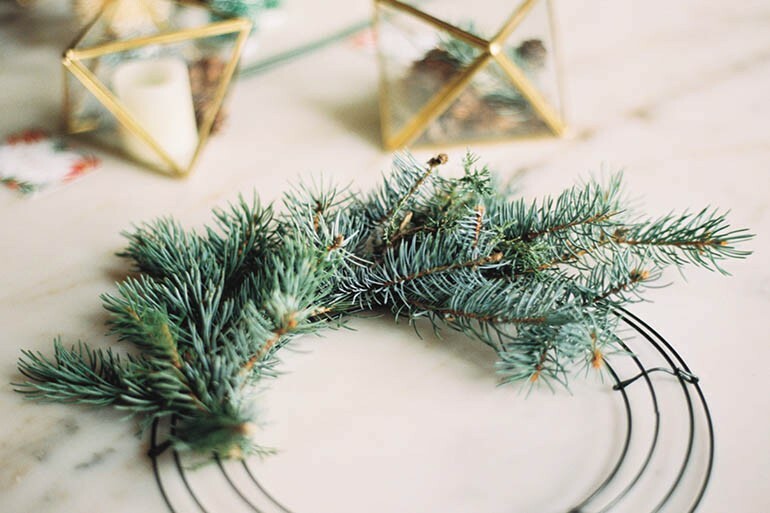 If making an entire wreath from the wires up daunts you, you can also buy a simple pine wreath and spruce it up with your chosen details. 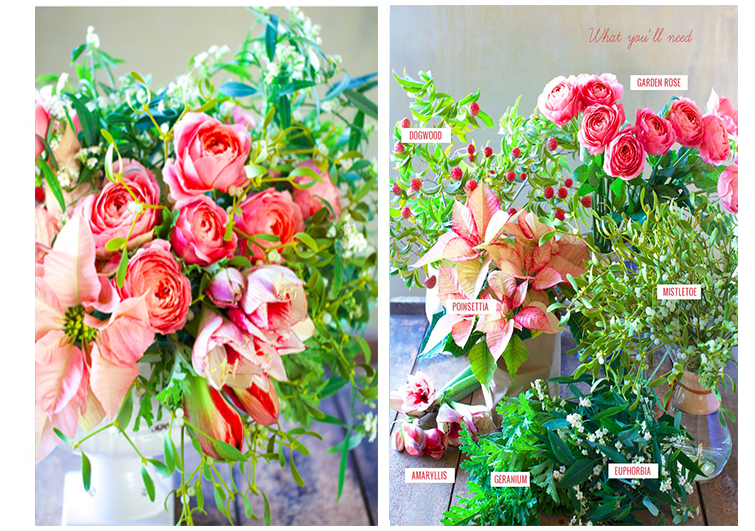 We’re completely wowed with this gorgeous centerpiece from Green Wedding Shoes. It’s overall color palette is just lovely. 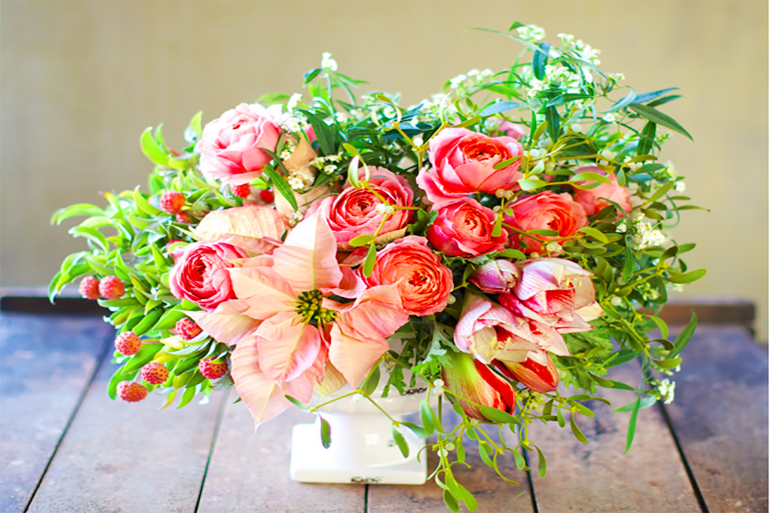 Not to mention it combines all of the must-have holiday florals (Dogwood, Poinsettia, and Mistletoe) seamlessly with some of our classic favorites (Garden Roses and Euphoria).This centerpiece will give your table charm from day to night. 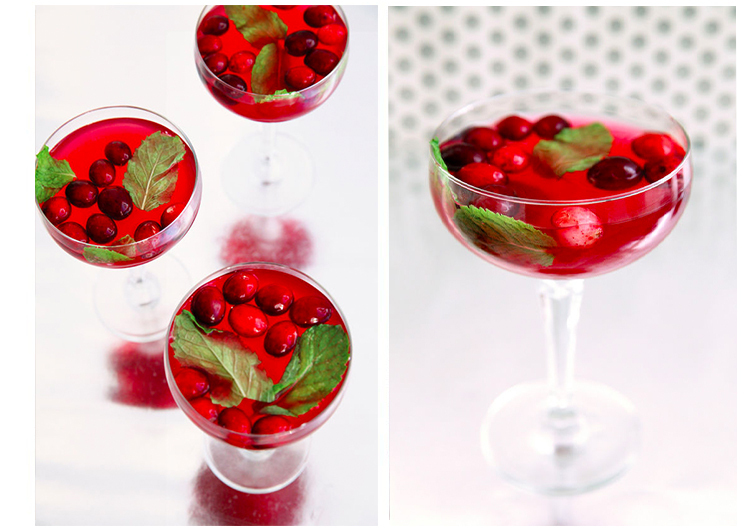 The cheery red color of these cranberry cocktails alone will add a punch to your holiday celebration. Not to mention it sounds pretty tasty! The full details for this delightful drink are on Design Love Fest. 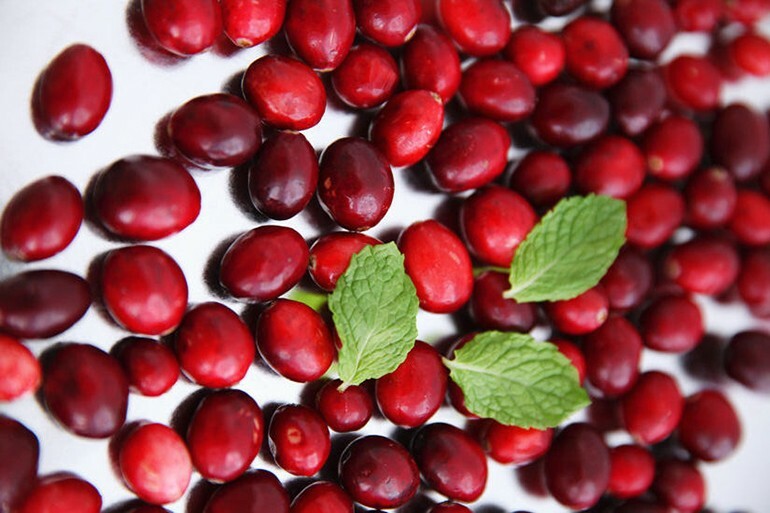 We’re loving the addition of frozen cranberries to keep your cocktail chilly throughout the evening. 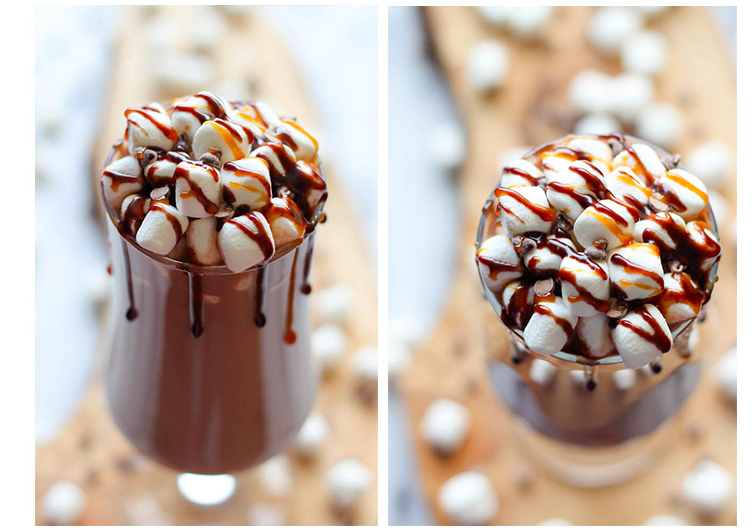 For those of you with a sweet tooth, this kahlua hot Chocolate is for your next festive féte. 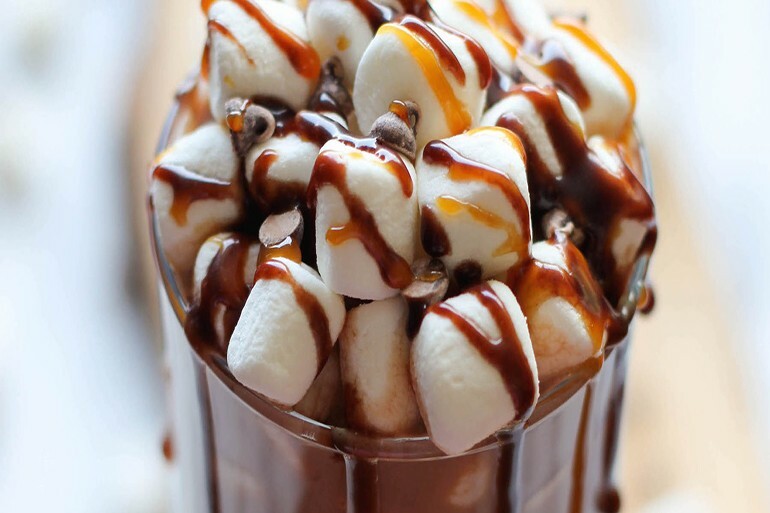 Mounds of marshmallows top of this toasty drink. Your guests will be feeling nostalgic and cozy while sipping on this hot coco. After all, it is the quintessential holiday drink. Check out damn delicious for the full recipe. Finally, to be the true hostess with the mostess you must also look the part. These dress and outfit inspirations will have you looking festive and foxy from head-to-toe. We took a couple notes from The Every Girl and Gal Meets Glam on how to steal the show with your wardrobe this holiday season. We know it’s shocking to suggest a little black dress. We just can’t deny the multi-use and functionality of a sleek dress in this shade. What we especially loved about this look from The Every Girl (besides the adorable presents!) is how it is accessorized. 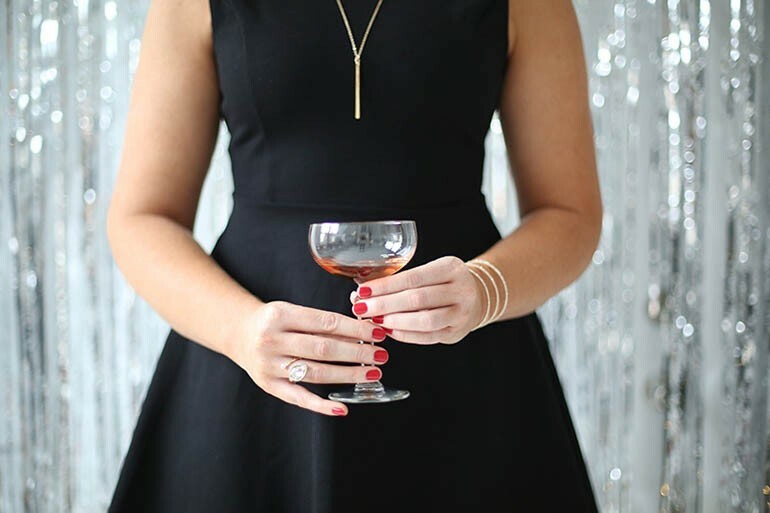 Yes- a little black dress looks stunning all year long, but during the holidays it looks best complemented by a jolly red manicure and sparkling accessories. Seriously- that cocktail ring is fabulous! We can’t deny that Julia Engel of Gal Meets Glam has mastered the Christmas party attire with this satin red dress. Wearing red is always a bold move and doing so at your own party will help you stand out as the host. We especially love how she pairs her little red dress with black tights. This fancys-up the look and gives it a more wintery feel. Even in LA, when the sun goes down it can get a little chilly. 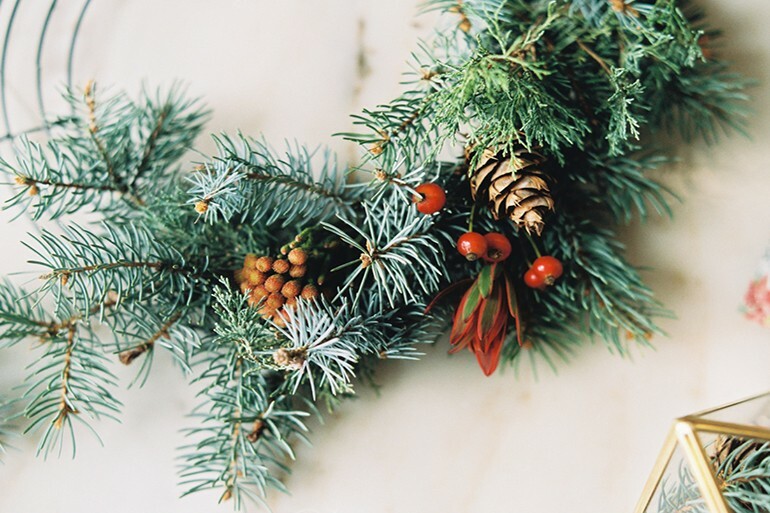 We hope you have a happy holiday season and that these Décor, Drink and Dress ideas help kick off your party planning. Even if you’re not hosting a get-together this season you can still implement these festive ideas into your life. Decorate the house just for fun, sip on a delicious drink the night before christmas, and shine in your perfect party dress at any seasonal gathering you may attend.